John Martin was at the double for Glenrothes. Stock pic. The Glens started the game meaning business and had a goal disallowed in the first minute when Martin was flagged offside. On 11 minutes, Glens took the lead when L. Schiavone ran half the length of the park and delivered a great ball from the wing for C. Schiavone to open the scoring. This was followed by a good spell of pressure by Glens, which paid off when Moffat was brought down inside the box and the official pointed to the penalty spot, with Martin converting the kick. On 30 minutes, an effort from Martin was cleared off the goal line. Glens pressed the Bathgate defence continuously until half time but could not add to their score. Straight from the restart, a run from Martin found L. Schiavone, only to see his effort come back off the post, then a long range shot from Napier was held by McGhee. Glens made an early second-half substitution when Celentano replaced C. Schiavonie. A minute later, they were dealt a blow when Walker looked to have damaged his hamstring and had to be replaced by Ormiston. On the hour mark, Glens made their final substitution when Celentano had to come off injured and be replaced by Trialist 2. The game was now scrappy but both sides had chances, with an effort from Bathgate substitute McKee cleared off the goal line by Moffat and a shot from Martin well saved by McGhee. 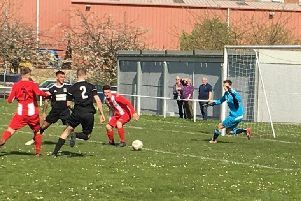 On 80 minutes, from a defensive error, Milton was able to scramble the ball home for Bathgate, and a game the Glens had under their control became nervous for the last few minutes. However, as luck would have it, a shot from Martin was cleared for a corner, from which Martin headed the ball towards goal. It then struck Taylor’s leg and was deflected into the net. A comfortable win in the end for the Glens and three points in their League Cup section. Glens now travel to Fauldhouse this Saturday on league business, kick off 1.45pm. Glenrothes: Gear, Kinnes, Leslie, Pearson, Moffat, L. Schiavone, Walker, Napier, Martin, C. Schiavone, Buchan. Subs: Celentano, Ormiston, Trialist 1, Trialist 2, Small.  Glens have been drawn away in the fourth round of the Scottish Junior Cup to Craigmark Burtonians based in Dalmellington, Ayrshire on Saturday, November 24. The club will be running a coach and there be a limited number of seats available.